FUE hair transplant donor overharvesting is one type of mistake that can be made during a procedure. This error can happen when Follicular Unit Extraction (FUE) surgeons harvest too many grafts on the back or sides of a patient’s scalp. This creates a thin, depleted appearance in the donor areas. In the recipient area, it may lead to the insertion of too many hairs or not enough. In this Q&A video, Dr. Umar discusses the topic of donor overharvesting in greater detail. 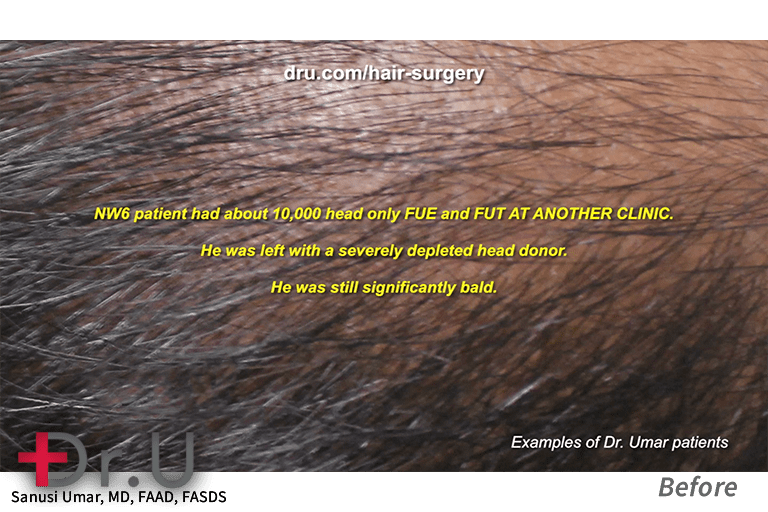 Example of Dr. U’s patient displaying a case of hair transplant donor overharvesting. Hair transplant donor overharvesting results from poor surgical planning and management. In a typical hair transplant procedure, grafts are harvested from the lower back and sides of the scalp. removing small amounts of hair, diffusely, across wide areas, instead of completely extracting one zone before moving onto another. harvesting an appropriate number of grafts to preserve the scalp donor area while producing a desirable form of coverage in the recipient area. When Follicular Unit Extraction first became available, many providers were quite overzealous as they focused on excessively on extractions over the final appearance of the donor region. They did not exercise much caution or foresight. As a result, FUE hair transplant donor overharvesting produced two types of mistakes. The patient above came to Dr. U with sparse growth from a previous procedure. Other clinics struggle to provide the necessary grafts for dense results. To avoid these results, Dr. Umar augments donor supply with body hair grafts using the Intelligent Punch (Dr.UPunch i). The use of head hair is appropriate for mild to moderate stages of male pattern baldness. However, when a patient reaches the severe phases, at Norwood 6 and Norwood 7, the exclusive use of head hair becomes problematic. These forms of hair loss usually require around 10,000 grafts to create adequate forms of coverage. Yet, the maximum number of grafts that can be harvested from the head (in mild to moderate cases of hair loss) is 8,000. At the point of severe baldness, patients only have a narrow wreath of hair at the base of their scalp. The number of hairs left is not enough to sufficiently cover the extent of baldness. This stage of hair loss is generally categorized as the Norwood 6-7 stages. Attempts to take grafts from these areas to cover a severely bald patient’s head would only produce poor coverage. Additionally, it would also leave behind a very thin FUE donor area. Dr. Umar’s patient was left with a very thin FUE donor area on the scalp after another clinic extracted 10,000 grafts. Patients with higher graft requirements can benefit from body hair grafts. 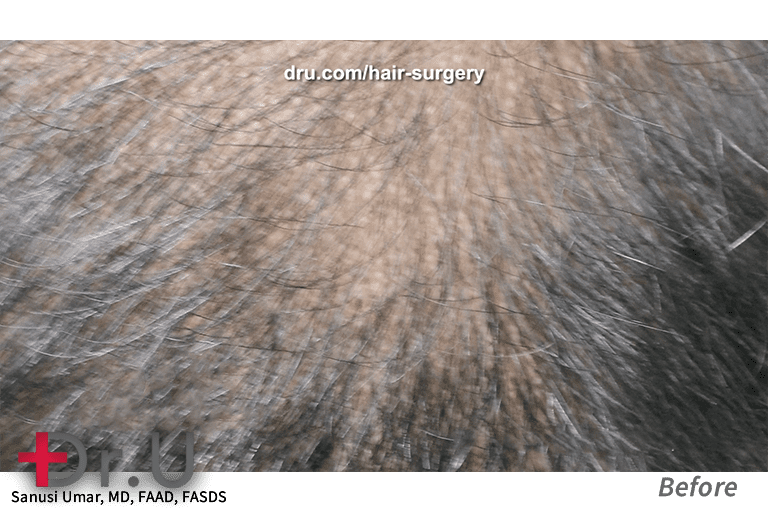 Dr. Umar uses the Dr.UGraft System to achieve this goal for severely bald patients. Dr. Umar recommends using both head and non-head donor areas to produce the donor pool supply for Norwood 6 and 7 patients. Body donor areas may include the beard regions on the face and neck. Other areas for consideration may include the abdomen, chest, and back. Non-head donor areas help provide the needed quantities of hair grafts which cannot be attained from the hair remaining on the scalp. Dr. Umar advises extracting small quantities of head hair. This helps to blend the texture of the body hair with the surrounding regions on the scalp. The use of body hair grafts expands upon the hair transplant donor area of the scalp. 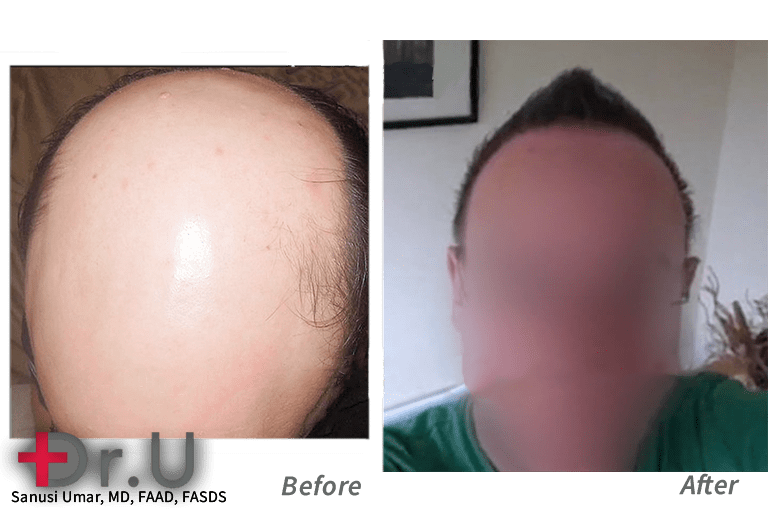 By using more specialized FUE hair transplant punches like Dr.UGraft™ technology, it is possible to safely harvest the large quantities of donor grafts needed to restore severely bald patients. Body hair appears to grow at certain sharp angles above the skin’s surface. But these angles change beneath the skin’s surface. Basic, general FUE punches are not able to follow these angulation changes without damaging the graft. The Dr.UGraft™ rotary punches focus on gripping the tissue around the graft during the scoring process, rather than the hair angle in order to safely remove the hair follicle. This patented engineering provides a reliable mechanism for extracting large graft counts from body donor areas. These large quantities are necessary to produce the best cosmetic results on severely bald patients and even repair bad hair transplant results. Learn more about the hair restoration and transplant repair case above. If you are interested in speaking to Dr. Umar about repair procedures for bad surgical results, including donor overharvesting, click the button below to sign up for a complimentary consultation.